The divisive battle between the Democratic Party's establishment and progressive wings for the Democratic nomination in Colorado's attorney general race escalated in a big way on Monday. Democratic governor John Hickenlooper waded into the race to endorse Phil Weiser, a former Obama administration official, in a last-ditch effort to prevent an upset victory by a progressive insurgency candidate, Joe Salazar, who enjoys the backing of Sen. Bernie Sanders (I., Vt.), the Denver Post first reported. 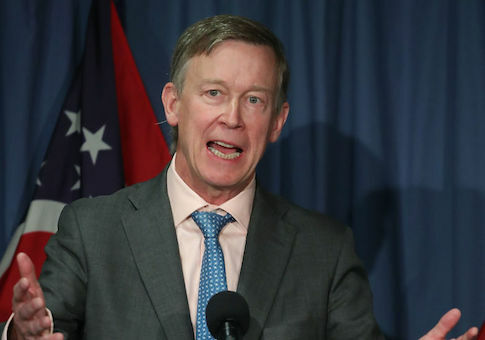 In his endorsement, Hickenlooper praised Weiser as an inclusive leader who could bridge the political and geographic divides between the state's voters. "At our best, we Coloradans are creative, collaborative, and inclusive," Hickenlooper said. "We don't look for leaders who divide; we look for leaders who can bring us together. Phil Weiser is just this sort of leader." Hickenlooper had refrained from backing any candidates running for office this election cycle, but asserted he was compelled to support Weiser because the candidate had showcased his commitment to running a positive campaign with ideas "aimed at building up all of Colorado." "His values have shown through in the type of campaign he's running—a positive, optimistic campaign about ideas aimed at building up all of Colorado," he said. "That's the sort of leadership we need." The governor's endorsement seems to be a direct rebuke of Salazar, a Colorado state representative and current front-runner for the Democratic nomination for attorney general. Salazar, a civil-rights attorney and three-term member of the Colorado General Assembly, has run an insurgency-style campaign with a willingness to attack both Democrats and Republicans alike. Hickenlooper and Salazar have openly clashed before on issues related to Colorado's oil and gas industry, with Salazar at one point taking to social media to lambast the governor for having swallowed the fracking "Kool-aid." The race between Salazar and Weiser highlights the struggle for power that has unfolded within in the Democratic Party between the establishment, aligned with the likes of former Secretary of State Hillary Clinton, and progressives, aligned with Sen. Bernie Sanders, since the 2016 presidential election. Weiser, a former dean of the University of Colorado Law School who served in both the Obama and Bill Clinton administrations, is heavily favored by the state's mainstream political establishment. His candidacy has received the high-profile backing of former U.S. Secretary of the Interior Ken Salazar, former Colorado Gov. Roy Romer, former U.S. Sen. Tim Wirth, and former state Attorney General J.D. MacFarlane, among others. Salazar, on the other hand, has long been a fixture in the state's progressive political landscape. In 2016, he was one of only a handful of Colorado elected officials to back Sanders over Clinton in the state's Democratic caucuses. The decision paid off as Sanders won Colorado by nearly 20 percentage points. Sanders and Our Revolution, the political action group that spun out from the senator's campaign, repaid Salazar by enthusiastically endorsing his bid for attorney general. Salazar has also garnered the support of the Colorado AFL-CIO, the Progressive Democrats of America, and a handful of elected officials. Polls have consistently shown Weiser lagging behind Salazar by double digits ahead of the June 26 primary. Salazar's lead in the polls has held firm, even though he is overwhelmingly trailing Weiser in fundraising. Between Jan. 1 and May 2, Weiser raised $326,000 to Salazar's $31,000, according to the Post. The disparity was even greater in the candidate's cash on hand totals, with Weiser having more than $880,000 heading into the primary while Salazar only had $7,127 on hand, as of May 2. The winner of the primary will face Republican nominee George Brauchler in the general election. This entry was posted in Politics and tagged 2018 Election, Colorado, Democratic Party, John Hickenlooper, Progressive Movement. Bookmark the permalink. Haris Alic is a staff writer at the Washington Free Beacon. Prior to joining the staff, Haris worked in communications and government relations at various non-profits. Haris lives in Arlington, Virginia. His Twitter handle is @realHarisAlic. He can be reached at alic@freebeacon.com.